It is said that he who goes to equity should do so, with clean hands and Kill the Rabbit the way you killed others, but the contrary has being exhibited by Justice Binta Nyako,the Wife and Mother of two Nigeria most corrupt politicians. Justice Binta Nyako who feeds from the corruption practiced by her Husband and Son, has a soiled hand and is not fit to handle any case in a court of jurisprudence. Former Governor of Adamawa State Murtala Nyako and Abdul Aziz Nyako are respectively the Husband and Son of Justice Binta Nyako, the presiding judge of Citizen Nnamdi Kanu's case. Mutarla Nyako and his son were detained by the Economic and Financial Crimes Commission, for Criminal Conspiracy, looting, Abuse of office and Money laundering. Top Government officials serving under Murtala Nyako's Government, were all arrested for same offences, as the level of corruption committed by the Nyako's are beyond human comprehension. Justice Binta Nyako's husband and Son were involved in 40Billion Naira Fraud and were arraigned in court on October 17th 2015 on *37 Count Money Laundering charges. It is very paramount for the World to know that, Justice Binta Nyako's Husband and Son who were involved in such heinous and intense crimes which attracted 37 Charges were trialed in the Public. But the Wife of this corrupt politicians, ruled on Secret Trial against IPOB Leader Citizen Nnamdi Kanu and three other defendants who only exercised their Self Determination Right in accordance with the United Nations Charter and were not caught with arms when abducted by the Nigeria State Security, rather their personal belongings like Cars,Money,Clothes etc were confiscated by the Nigeria Government and is yet to be returned upon till today. Justice Binta Nyako who in Federal High Court 4 Abuja on the 13th day of December after her secret trial ruling against IPOB Leader stated "This Court Is Mine And I Will Use It The Way I Want", must not be allowed to violate the right of Innocent citizens, because the Wife and Mother of corruption cannot rightfully deliver justice to the innocent. 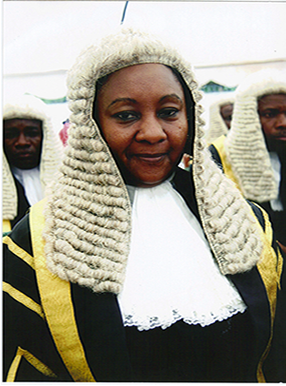 Justice Binta Nyako's Husband and Son, were trialed in the open, granted bail and their 37 count charges did not detain them for up to a month though their case is still pending, but Citizen Nnamdi Kanu whose followers has being victimised,Raped,Brutalised and Killed has being unlawfully incarcerated over one year, after being granted bail by Justice Ademola in same Federal High Court Abuja. One will begin to wonder why Nigeria a country that practices common Law, is delivering rulings based on civil law. This outrageous and astonishing act of Justice Binta Nyako who was appointed by the President of Nigeria Muhammadu Buhari,is indeed a stain on the white cloth of justice and must not be allowed, because the liberty of men who has being unlawfully incarcerated is at stake and no human right should be violated, not even by Justice Binta Nyako who runs the court like "Her Court". The Leader of IPOB Citizen Nnamdi Kanu had on the 13th of December 2016 refused the secret trial ruling of Justice Binta Nyako and the International Community must key into his demands. Justice Binta Nyako's husband and son were tried in an open, hence she has no right to trial anyone in secret. It is very obvious she is following the dictates of Muhammadu Buhari, but in a case of fundamental Human Right, she has no right to violate it. Justice delayed is not a justice denied but in Nigeria, Justice delayed is justice totally denied. Binta's husband and son were very much corrupt to the extent that looted Adamawa State dried in 2011. The husband also diverted so military hardwares bought against boko haram terrorists to boko haram. The world must start from the root to dig out issues, because Binta herself is corrupted and not qualified to handle or preside any case. It takes the secret cults to operate in secrecy. Men who have nothing to fear have nothing to hide. With 37 charges both father and son were tried openly. What stops people with a mere 11 charges as amended from getting the same open trial. An effluvium of injustice is pervading the entire atmosphere of Justice Dinta, sorry Binta Nyako's self acclaimed court. Yes! Dinta may own a court that belongs to the public, because Buhari may have sold it to her. But does she also own the right of CNK and Co? The answer no. To this end, Bunts should resign from this case on the grounds of gross incompetence. Twisting of law is equals to or greater than lootocracy. It is the mother of all corruption to twist the law for oppressive and subjugative interests. Dinta has shown a proclivity to corruption. She should hands off this case and that with immediate effect. Gbam, you nailed it . We must never allow the secret trial of Nnamdi Kanu and others. We must not allow this to happen to our leaders and liberators. We are not Islamic but Christians. We must never allow this travesty of justice to take place period!